Now that I’ve gotten all the vacation stuff out of the way let’s get back to what is going on around here. It’s that time of the year to join the Readers Imbibing in Peril challenge! This challenge started by Carl V., and hosted this year by The Estella Society, is now in it’s 10th year. Isn’t that fantastic? The challenge started September 1st and runs through October 31st and involves reading stories that fall into the categories of: Mystery, Suspense, Thriller, Dark Fantasy, Gothic, Horror and Supernatural. There are various Perils (levels of participation) you can choose and I’m going to join Peril the Second – Read two books of any length that fit within the R.I.P. categories. 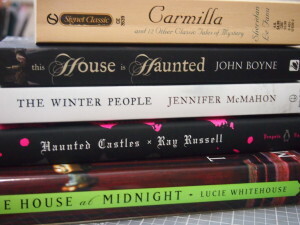 Here is a short stack of books from which to make my selections. I’m not making any promises on these being the ones I read because you know how it goes. But if there’s a book here that I must read let me know. So just in case you haven’t joined yet, go over to Estella Society and sign up. There are more than 150 readers joining – what are you waiting for! Now, off to choose my first book for the challenge. Have a wonderful weekend and more book talk soon. I’ve seen/heard lots of Carmilla chatter lately! I hope you enjoy the books you can get around to! 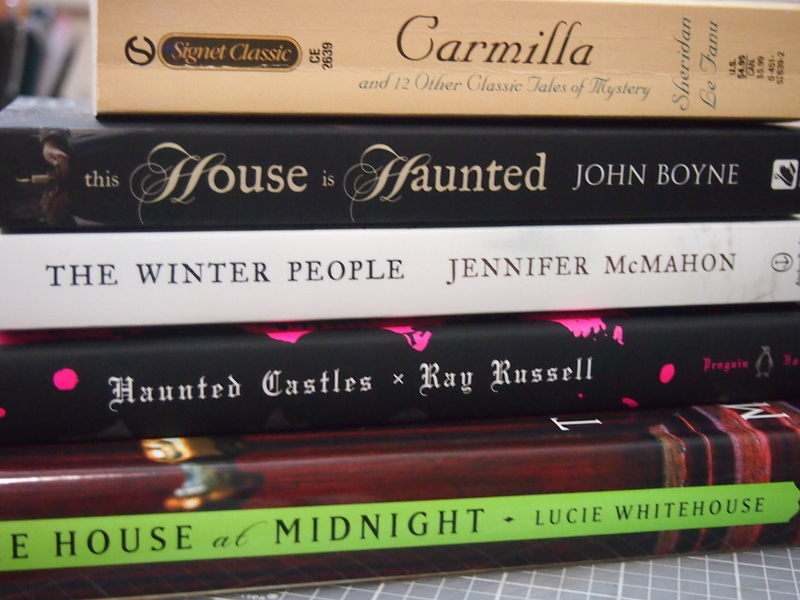 I read Carmilla a couple RIPs ago and it is good gothic and vampire fun! Jenclair – What?! 🙂 I understand it’s hard to keep up with all the challenges. Looking forward to hearing about the books you do end up reading anyway! Andi – Oh glad to hear you’ve been hearing good stuff about it! 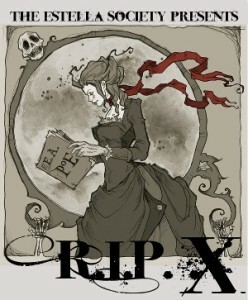 Stefanie – I think I was a bit burnt out on all the vampire fiction but I think I could be ready for this one finally! I read The Winter People and thought it was suitably creepy. I enjoyed the Boyne as well! Have fun making your choices–it is *finally* starting to feel like fall outside.